A third consecutive league win and a second clean sheet have lifted Motherwell into a comfort zone well above the bottom three. Saturday's game saw us on the back foot for long spells but the score-sheet tells the tale, 1-0 to the visitors. There were no complaints from the 400 Motherwell fans at Dens Park that our win was, in large part, due to the pathetic inability of Dundee to shoot on target. They had at more than half a dozen opportunities to test Mark Gillespie but our guardian was called into action only once. Robinson on Turnbull signing: "Ongoing and should be sorted very very soon"
We allowed the opposition little room inside our penalty area but they had several tasty sights of our goal from longer range. How can it be that professional footballers often fail to fire a ball from inside 20 yards to hit a target that measures 24ft by 8ft (that's almost 18 square metres)? 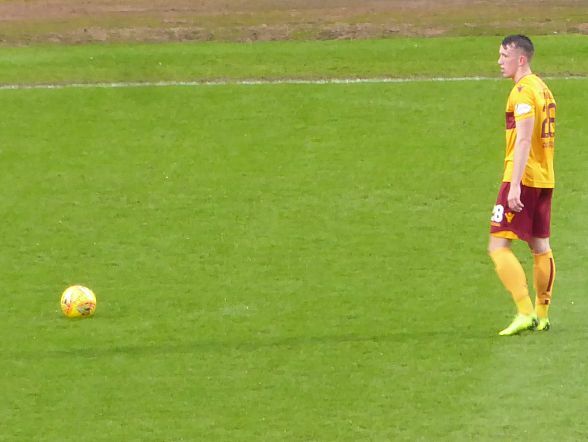 David Turnbull remained in the spotlight for his clinical conversion of the penalty but that should not detract from the huge contribution that Curtis Main has made in the last week. Against Hibs on Wednesday and against Dundee he played the lone striker position with energy and determination. He collected and held time and time again before bringing others into play. In the lead up to the turning point of the game he drew the attention of three Dundee players yet still managed to pass to a friendly shirt to keep our forward momentum flowing. The penalty followed seconds later. A look at the league table suggests that our ambition now should be to claw upwards rather than to look behind. With Livingston and St Mirren next on the agenda there is every incentive to stretch the happy run.